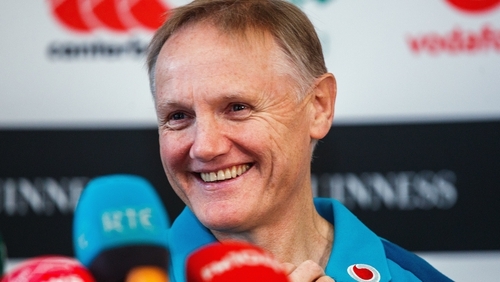 With almost a full deck to pick from, Joe Schmidt found himself with a few close calls to make for today's announcement of the Ireland team to face Argentina this weekend. Conor Murray, recovering from a neck injury, is not around. The boss won't kill off the stories that he might come into the frame for New Zealand on Saturday week but then again, why would he? Somewhere along the line Garry Ringrose "got a bang on the hip". Once again, one of the three centres, along with Bundee Aki and Robbie Henshaw, favoured by Schmidt is not fit so that call can be put back, possibly just for one week. "He's actually probably recovered from that mostly," said the head coach of the Leinster man, who played and scored for Ireland against Italy last week. Rob Kearney, a go-to man of 86 caps and a couple of Grand Slams, "was involved in the session today" but the game comes too soon after a shoulder injury. Schmidt admitted that Kearney's problem took a decision out of his hands and revealed that, all going well for 21-year-old Jordan Larmour against Argentina on Saturday, the 15 shirt is between those two, not even dropping Will Addison's name into the mix. "You are always looking to make decisions and be proactive about offering opportunity but at the same time there are players who have earned a position in the team and somebody else has to come along and grab it off them," he reasoned. "Those two will probably continue to tussle when Rob's available next week." This time last year, the Kiwi coach had spoken about opportunities coming for players in big Tests organically as opposed to taking a risk for the sake of it. Here's that coming to fruition. The other debate pre-announcement centred on the four-into-two second-row equation and Schmidt went with James Ryan and Iain Henderson, the starters from the final Six Nations game in Twickenham. Devin Toner is selected ahead of Tadhg Beirne on the bench, but either or both could come into the reckoning next week. "We're trying to manage his time a little," said Schmidt when asked about the omission of the Munster man who scored twice against Italy last weekend. "He had his first start last week, did really well and is certainly in the mix. "But we had two fresh second rows as well. And we wanted to make sure that they were ready to be in the mix for next week. "Effectively, we'll have had five second rows who have had an opportunity to put their hands up for three spots next week." Quinn Roux is the fifth man in there but, as solid as he goes, he's not quite at the level of the other four contenders. As expected, Kieran Marmion plays alongside Johnny Sexton with Luke McGrath, who was overlooked for the summer tour behind John Cooney, favoured over the in-form Ulster scrum-half as a replacement. Schmidt said: "I thought John Cooney was really good off the bench, so that was a headache and an elongated discussion for us. "But we thought Luke was probably more familiar with the environment and the level. "Kieran got some time last week [for Connacht] and played well. He got a knock on the ankle and just missed two games in a row. "So for him to be in the mix next week we felt he had to play this week. Sean O'Brien resumes his international career after a year's absence and that means that the pack is the same that lined out against Los Pumas 12 month ago. "Seanie adds a massive amount to the group," added Tadhg Furlong. "Not just through experience, but also through his leadership, adding a constant voice." If there was a surprise in the 23, the inclusion of Dan Leavy may have raised some eyebrows. The flanker starred for Ireland and Leinster last season but it was felt he may have enough lacked game time this season to force his way in. Not so. Murray is probably the only nailed-on player missing from a potential XV that could start a major World Cup game. Ireland: Jordan Larmour, Keith Earls, Robbie Henshaw, Bundee Aki, Jacob Stockdale, Johnny Sexton, Kieran Marmion; Cian Healy, Rory Best (c) Tadhg Furlong, James Ryan, Iain Henderson, Peter O'Mahony, Sean O'Brien, CJ Stander. Replacements: Sean Cronin, Jack McGrath, Andrew Porter, Devin Toner, Dan Leavy, Luke McGrath, Joey Carbery, Andrew Conway.